The corpus callosum is a collection of many millions of nerve fibers in the middle of the brain. One of it’s functions is to connect the right and left sides of the brain to allow for communication between the two sides, or hemispheres. The corpus callosum coordinates signals from different parts of the brain and helps us in our thinking. Agenesis of the corpus callosum is a birth defect in which this structure in the brain is either partially or completely missing. It may occur as an isolated brain problem, in combination with other brain abnormalities, such as ventriculomegaly, or in combination with problems with other organs, such as a congenital heart defect. Agenesis of the corpus callosum is caused by disruption of the development of the fetal brain. This disruption may be related to chromosome errors, genetic factors, prenatal infections, or other factors related to the prenatal environment. In most cases, it is not possible to know what specifically caused the disruption. What is the outcome with agenesis of the corpus callosum? Some children with agenesis of the corpus callosum have only mild learning difficulties. Intelligence in the child may be normal. Other children may have severe handicaps such as cerebral palsy, severe intellectual or learning disabilities, autism or seizures. Whether a child has these symptoms or difficulties depends partly on whether other brain development problems are detected on MRI and whether there is a problem with the child’s chromosomes. Throughout childhood, the nerve fibers of the corpus callosum continue to grow and become more efficient, even through the teenage years. At this phase in their development, children with a normally formed corpus callosum make progress in their abstract reasoning and problem solving, and their social skills mature. A child with agenesis of the corpus callosum may keep up with his or her peers until this age; however, they may begin to fall behind in schoolwork and social functioning. Therefore, the symptoms of agenesis of the corpus callosum can become more evident as a child grows into adolescence and young adulthood. How serious is the agenesis of the corpus callosum in my fetus? If your doctor sees a problem with the corpus callosum, they may refer you for several tests, if these have not already been done. These include a more detailed ultrasound (often times called “Level II ultrasound” or “Fetal Survey”), amniocentesis (to look at the genetic makeup of your fetus, and to look for any signs of infection), and fetal magnetic resonance imaging (Fetal MRI). Fetal MRI is another way to safely look at your fetus’s brain. It provides pictures of your fetus’s brain using different technology than ultrasound. Because it uses a different technology, fetal MRI can detect other problems in your fetus's brain that cannot be detected on ultrasound. We can then look at the results from all of the tests together and your physician can speak with you about the significance of these test results. 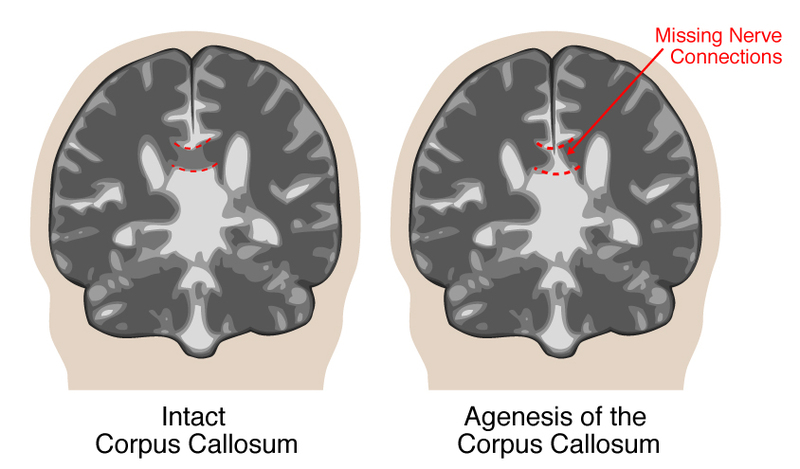 What treatment is available for agenesis of the corpus callosum? There is no treatment before birth for fetuses with agenesis of the corpus callosum. Treatment after birth involves managing the child's symptoms. It is important during your pregnancy to get a detailed diagnosis (via detailed ultrasound, amniocentesis, and MRI) in order to determine if there are any additional problems. Our staff can talk to you about these test results and inform you of what challenges you may expect. If there is evidence of more severe handicaps that require long-term care, we can help direct you to the appropriate specialists. National Organization for Disorders of the Corpus Callosum — an organization to provide information and a communication link for individuals with brain anomalies involving the corpus callosum, their families and the professionals who work with them.